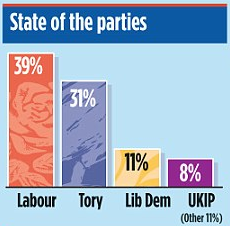 Polling company Survation has UKIP firmly in fourth place on 8%, just 3% behind the Lib Dems. The poll for the Daily Mail isn't available on the Survation website yet so we don't know whether this is a backlash against the so-called "granny tax", the EU attacks on the city with the GLA elections looming or just a continuation of UKIP's excellent polling performance in the last year or so. Votes for "other" amount to only 11%. Survation and Angus Reid recognise UKIP's place in mainstream politics and its consistent polling results and put the party on a par with the LibLabCon, leaving only YouGov in the major polling companies that persist in maintaining the myth of the three party state. More on this when the data tables are available.